You always see rings listed online and in jewelry catalogs as “semi-mounts“. “Semi-mounts” are a name given towards a mounting that’s only semi-completed. It’s not fully finished. It’s missing the center stone. 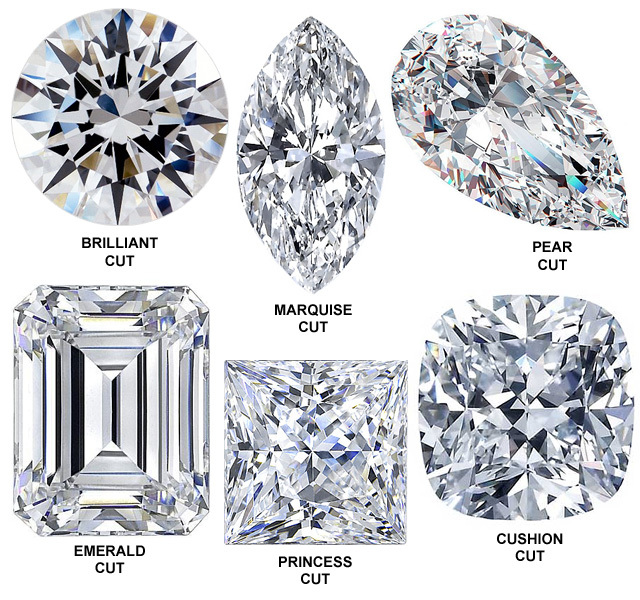 So whether you already have a diamond you want to set, want to buy a new diamond (or a bigger one), or even a gemstone like sapphire, ruby, emerald, morganite… these types of mountings are made for customization. The ring is sold separately. 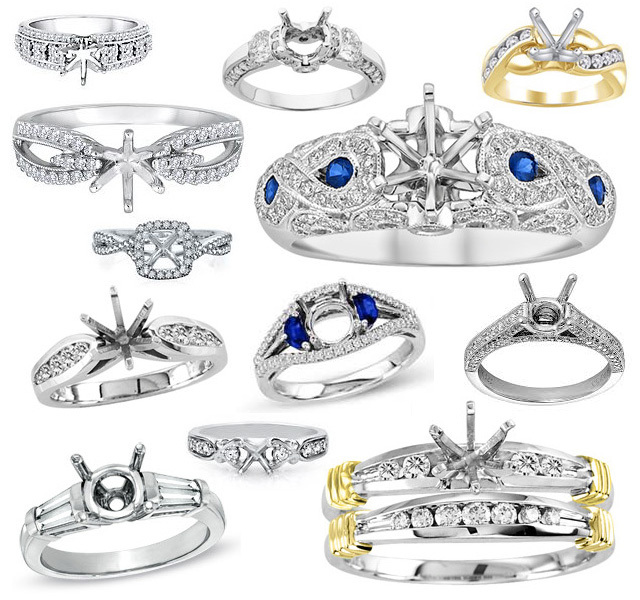 And the variety of semi-mountings is endless. Some have diamonds down the side, others are plain. Some are yellow gold, rose gold, white gold, platinum… A mixture of metals. It’s all about what suits you and what strikes your fancy. What’s the purpose of a semi-mount? It’s all fun and appealing. Semi-mounts allow you to pick and choose what style you like. What quality. What carat weight. It helps you achieve that one-of-a-kind look. Plus, semi-mounts do one other thing that’s awesome; you get to focus on the center stone. You can view it up-close and personal. Loose diamonds (versus mounted) allow you see the diamond magnified, under a scope. You can see every detail, every inclusion, every facet and flaw from all sides and angles. It’s for the serious buyer. You see everything. Plus, you can compare the loose stone to the actual certificate (I recommend GIA or AGS only). Compare the plot to the real stone. Find all the imperfections. You can get really picky about the exact quality, cut, culet, certificate you want. Semi-mounts are the only way to go. The order you do these in doesn’t matter much… Just keep in mind that some semi-mounts only hold one exact size of diamond (the prongs are part of the mounting, or it’s set in a bezel or tension). 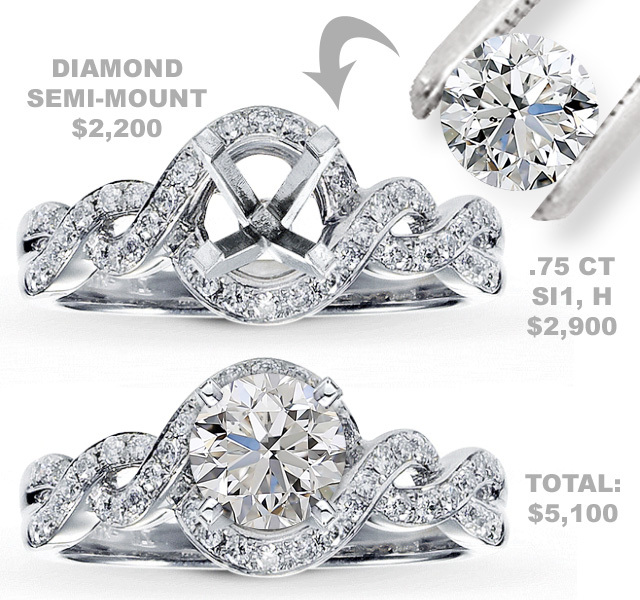 It’s generally easier to pick the diamond first, and then find an appropriate mounting that compliments it. Where can all this be done? At James Allen or Blue Nile. Their prices are the lowest you’ll ever find anywhere (that’s the great thing about shopping online). So check them out and build the diamond engagement ring of your dreams.